The first 3 posts explored the process to define project requirements as behaviors. Once you have mastered writing BDD stories you are ready to start the journey towards the automation of scenarios. Decision on which framework to choose should be based on which technology your team is most comfortable with, as well as the support it provides for the implementation of the phases described below. Next post in this series will provide comparison of different BDD frameworks. Successful implementation of the BDD automation should be done in three phases. Create library of normalized steps. Empower scenarios with examples tables. You should start with the first phase. As soon as enough steps have been created to support the first scenario, you can start with execution of the other two phases. From there on, work on all three phases should be done in parallel. There are several things to bear in mind when creating the library of normalized steps. This allows us to write stories without programming skills and they can be understood by anyone. When working on scenarios, all you need is to write given, when and then steps. It can be very time-consuming to write code for every single step someone writes in scenarios. In most cases, the number of different actions or verifications that can be done in an application is limited. For example, in Web applications you can click an element, verify that the value of an element is as expected, select a drop-down list option, etc. These steps can be created in advance and used when writing scenarios. One suggested approach is to create a separate class for each type of application developed within the company. There can be a separate class for Web steps, database steps, API steps, operations steps, etc. All these classes should be part of one common class containing steps that can be used by each of these applications as well as helper methods. Later on, if different products use the same application type, there might be the need for steps specific to that product. In that case, more classes should be created and they should extend the class created for that application type. Following the same example, CommonSteps would have steps and methods that handle the declaration of variables, logging, setup, and teardown, etc. WebSteps would have steps that provide actions to click different web elements, validate whether the text of an element is correct, etc. MyWebSiteSteps would have steps that are specific to the internet site and cannot be applied to other applications based on Web (for example, back office). The number of steps in this class is usually small. In many cases it would not have a step, but be used solely as a place to define composites (explained later on). In this example we used two different steps that can be reused in many other cases. One is to type some text in a field (When the visitor types $text into the $id field) and the other is to click a button (When the visitor clicks the $id button). By combining these steps, the same functionality is accomplished as if the new step “When the user logs in” had been used. There was no need to write any additional code. Having a clearly defined steps format will mean scenarios can be written more quickly because the time spent looking for the appropriate step or second guessing what to write will be reduced. In the above example, all click actions follow the same format. You only need to know the product (Web, Back office, etc) and the type of element that should be clicked (link, button, web element, etc). The product from this format should reflect the organization of steps described in the “build the steps library” section. The code behind that step would read the system property webDriver and open the appropriate browser. Often there are different steps that perform the same action or verification. For example, in a Web page you can click a link, button, div element, etc. For the sake of clarity, there could be different steps for each of these types of elements. However, the code behind all those actions should be the same. Repeated code can be avoided by using aliases. "Web user clicks the $id link"
This example would enable scenarios to have different ways of expressing the same action: click a Web element. This step can be written as a composite that uses the set of predefined atomic steps. "Then the confirmation screen is opened"
No code was written to support this new step (excluding Java annotations). Instead, existing steps are grouped together to create the new composite step. As the number of scenarios increases, so does the repetition of scenarios. The following example from the previous post defines the variations of one scenario using the examples table. This scenario will be executed four times: once for each row in the examples table, and variables defined using < and > will be replaced by the values in the table columns. BDD is an agile process that puts emphasis on stakeholder value. It proposes a unique set of artifacts written in natural language. 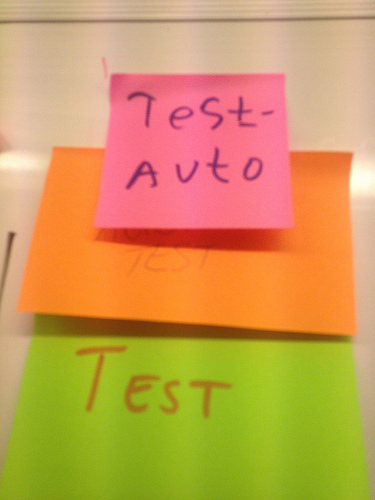 Is it a way to do test-driven development with more clarity. BDD narratives are NOT requirement statements. Everyone can write them. This entry was posted in Behavior Driven Development (BDD) and tagged BDD, Behavior-driven development, Cucumber, Java, JBehave, Programming, RSpec, SpecFlow, testing on December 8, 2013 by Viktor Farcic. to read morе, thanks foг the advice!